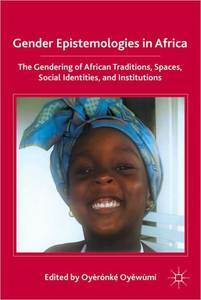 Gender Epistemologies in Africa was an indexing project prepared for the volume on commission by the editor, Prof. Oyeronke Oyewumi of SUNY, Stony Brook University. The volume is available for order on the website of the publishers, Palgrave Macmillan (http://www.palgrave.com/home/index.asp) and all major online retail stores including amazon.com and Barnes and Noble. This book brings together a variety of studies that are engaged with notions of gender in different African localities, institutions and historical time periods. The objective is to expand empirical and theoretical studies that take seriously the idea that in order to understand gender and gender relations in Africa, we must start with Africa. If gender emerges out of particular histories and social contexts, we must therefore pay attention to the histories of genderings as well as the continuous ways in which gender is made and remade in everyday interactions, and by institutions. In this sense then, “gender” is actually more about gendering—a process—rather than something inherent in social relations. Oyeronke Oyewumi is Associate Professor of Sociology at SUNY Stony Brook. She was born in Nigeria and educated at the University of Ibadan and the University of California at Berkeley, Oyewumi has been widely recognized for her work. The monograph Invention won the 1998 Distinguished Book Award of the American Sociological Association and was a finalist for the Herskovitts Prize of the African Studies Association in the same year. She has garnered a number of research fellowships, including Rockefeller Fellowships, a Presidential fellowship, and a Ford Foundation grant. Oyewumi's most recent research support was a Rockefeller Humanities Fellowship on Human Security (2003/2004), managed by National Council for Research on Women. (NCRW).